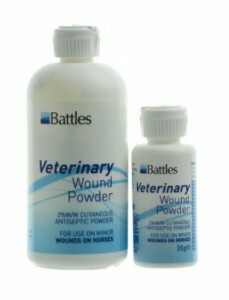 Battles Veterinary Wound Powder contains 2% Toluene p-sulphonsondiochloramide (chloramine). Suitable for use on - Horse, cattle, sheep, goat, pig, chicken. For use on everyday minor cuts and wounds.